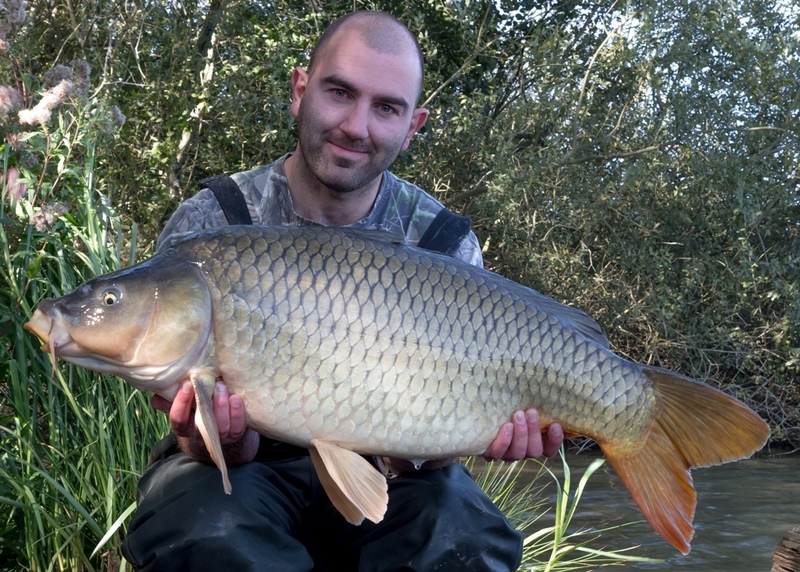 Like most UK carp anglers I love fishing on the continent and targeting the big carp that are on offer in countries such as France and Spain. Having not fished abroad for a number of years it was with some excitement that at the end of September I prepared to cross the channel into France and head to the Champagne region south east of Reims to spend a week on the highly regarded Domaine du Brocard. After an unnecessarily laborious journey on the UK motorway network we arrived at the lake on Saturday lunchtime to be greeted by head bailiff Franck Schmitt. First order of proceedings was to sit us down in the cabin, issue us with a cold beer (a very welcome surprise) and talk us through the previous week’s catches, pointing out the most productive areas in front of our chosen swim. Following the formalities we arrived at swim 10 on Brocard Large lake and got our first sight of what we would be tackling during the week ahead. The place was incredible. Standing taking in the atmosphere I couldn’t believe my eyes when an Osprey silently floated over my head, less than 30 feet away. Being as much of an enthusiast for nature and wildlife as I am for fishing it was an unexpected but amazing surprise to see such an incredible creature for the first time in the wild and at such close proximity. After that initial excitement we set about baiting up and casting out. I was fishing for the week with my brother, Matt, doubled up in the swim and we opted to split our approaches to determine what the most successful tactic would be. I started by baiting an area with around 3kg of 20mm bottom baits mixed with Tiger nuts across a reasonable compact area whereas he opted to fish single 20mm bottom baits with a scattering of bottom baits using a throwing stick. The first 24 hrs saw Matt get off to a flying start, landing six fish to over 32lbs including some real stunners. Matt continued to with a steady flow of fish over the next 24 hours to his scattered bait tactics whereas I was still to get a bite. In fact it wasn’t until the early hours of Tuesday morning that I got off the mark with a 33lb 5oz Common. I was both relieved and buzzing with excitement at landing my first fish of the week and also my French PB Common. It’s always an interesting challenge when fishing at a new lake for the first time and one of the factors that took me by surprise was just how shallow the water was.  The depth averaged only around 3ft so wading was essential for both casting and landing fish. At around 11am I recast my rods and within half an hour I was in again. 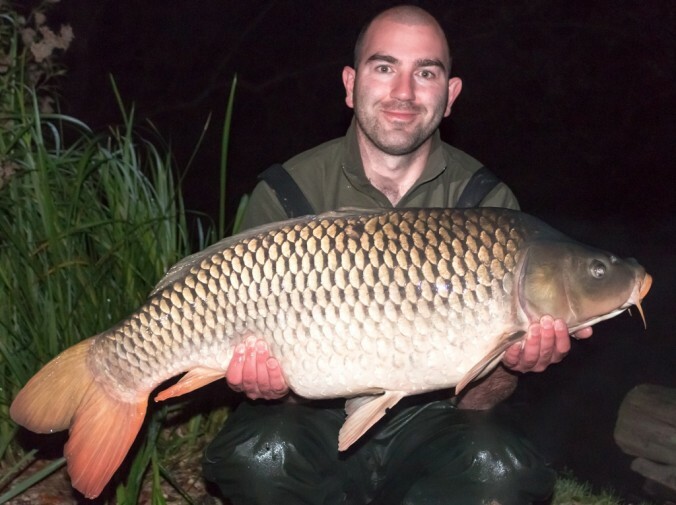 After a steady fight Matt slipped the net under my second fish of the session, another immaculate common of 32lbs. A few pictures were taken as well as a bit of video footage of me releasing the fish and I was left reflecting on having caught a brace of 30lb commons in less than 12 hours, something I have never previously achieved. Over the course of the week the weather fluctuated as Summer prepared to hand over to Autumn. The nights were particularly cold but the early autumn days were stunning sitting in the total peace and tranquillity of the French countryside. I’ve been fortunate to fish all over the world in some incredible locations but I can’t remember having ever fished anywhere that was as quiet as Brocard. As the week wore on it had become evident that the Carp were obviously very used to having such peaceful surroundings and were sensitive to any unexpected level of disturbance. Due to patchy but quite dense weed that was evident on my side of the swim it was necessary for me to wade quite a way to reach the most productive area. In hindsight it would have been better to have been able to fish at closer range and create less disturbance but it’s all part of working out a new water. Due to the barbless hooks rule in place on Brocard, fishing at such range and around quite dense weed did make playing fish a little nerve wracking. 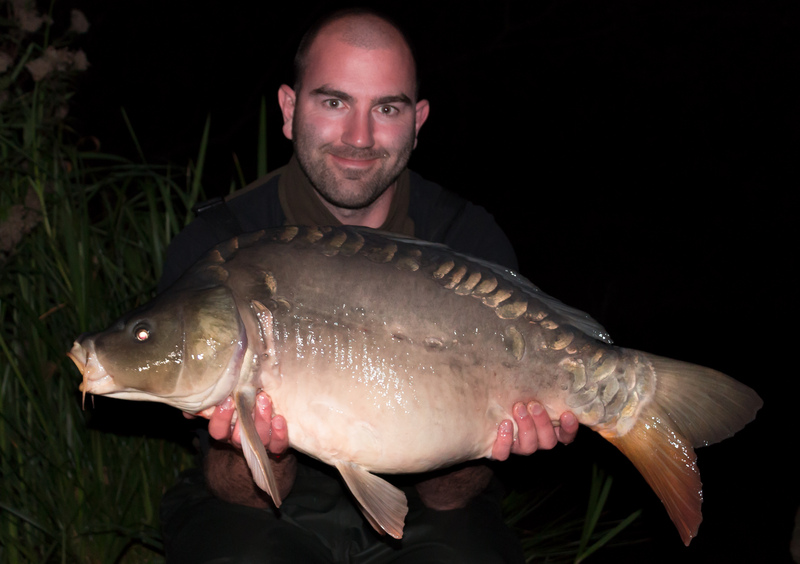 I did lose my next three fish and it wasn’t until the early hours of Thursday that I landed another, this time a Mirror of 23lb 4oz. As the week drew to a close Matt managed to land a few more stunning fish, including a 41lb 3oz Common which was awesome to see on the bank. In total we had 17 fish between us during the week, Matt with 14 and three for myself. Although the week was far from prolific in terms of our captures I wasn’t at all disappointed. I would have liked to have caught a few more fish but I can certainly have no complaints with what I did catch. Brocard is quite simply stunning and it was great to be back out in France enjoying a change from the usual fishing I have back in England. It was a thoroughly enjoyable week that was both relaxing and challenging in equal measure. The Bailiff Franck was a fantastically helpful guy and did his best to help us out during our trip. With its amazingly peaceful surroundings, quality fishing and fantastic shower facilities I know I’ll certainly return to Brocard in the near future to have another go at catching some more of the incredible carp. Anyone looking for a true taste of French carp fishing should certainly visit the Angling Lines website and book for their chance to enjoy this brilliant lake.